Every marathon hopeful is confronted with the 20 mile training run. You have to determine: if you are going to do it; when you are going to do it; and how many times you are going to do it. Well, when I saw the above notice for an organized 20-miler in NYC, I decided that I would do my one 20 mile run with JackRabbit, a prominent running and triathlon store in NYC. The run was advertised to commence at JackRabbit in Union Square and we would stop at the other store locations on the Upper West Side, the Upper East Side, Brooklyn and then back to Union Square. Some of the members of my marathon group decided to do it too. So we embarked on this adventure together. Of course if you are running 20 miles you can only hope that everything outside of your control lines up perfectly because running that kind of distance is a hard enough challenge by itself. So naturally after waking before daylight, Accuweather tells me that it is going to start raining in 23 minutes. Sweet!!! I took the train into Manhattan with two members of the team, Janet and Jazz. And of course we are approached by someone who looks like she could be Ann Margaret, who tells us we are raising the sound barrier and that a person named Susan Davis is laying down with white supremacists. We back away from the woman but she near chases us down in Penn Station. Janet promptly takes responsibility for being a magnet for the unstable but we let her continue to hang with us anyway. We meet up with our other two teammates and proceed to Union Square. We got there early and when the store opened we got ourselves together and received a pep talk from this gentleman. He went over the course (I was not paying much attention to that part) and then he imparted some wisdom. He told us that something interesting was going to happen between miles 17 and 20. I perked up for this part of the speech. What was going to happen? Was it the infamous wall? Would we have a meltdown? He must have seen the look of alarm on our faces because then he said, “It’s good, it’s good.” Great, at least I have something to look forward to on this long trek. We then huddled with our pace groups. I was with the 11 minute mile plus group. So what if we were the slowest group. So before we leave our fearless pace group leader announces that he is not wearing a watch so will not know exactly what pace we are running. But then he said we will be taking our time because our goal is to finish regardless of time. Okay, I was good with that. Then of course the man takes off like a rocket for the first mile. Yikes!!! I was a little concerned because I had no idea of the route because this Einstein had not been listening. Anyway, someone sent our pacer a memo and he slowed down during mile 2. Now up until that point it was raining but it was more drizzly than anything. However, at some point while we were on the West Side Highway the skies completely opened up into monsoon mode. It was a little uncomfortable but we were on a bike/running path with very little pedestrian traffic. 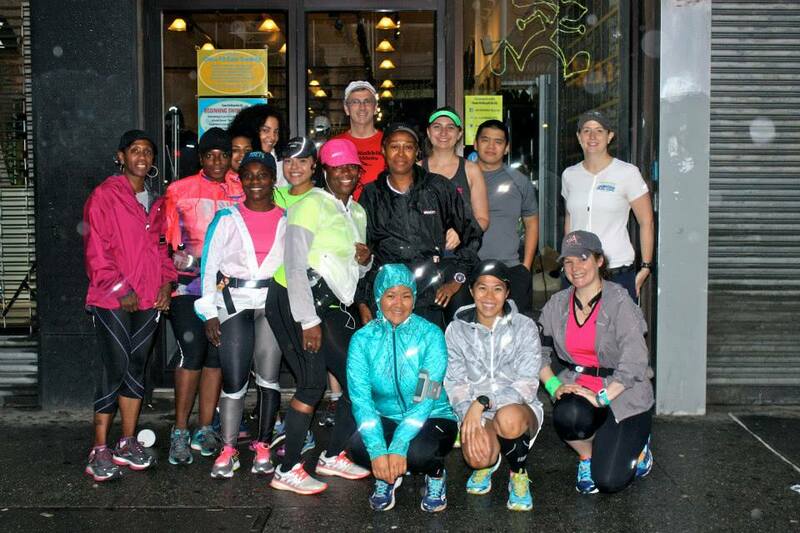 After 4 miles we arrived at the Upper West Side store. They were playing “The Final Countdown.” I was stoked. It was nice to get out of the rain for a minute and they had water, gu and a concoction they were calling “gu brew.” I tasted the brew, it wasn’t bad but I didn’t have too much just in case it upset my stomach. 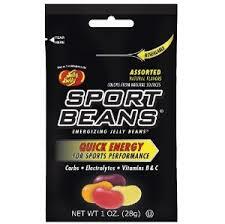 I chowed down on a couple of Sport Beans. I love those things. Pace leader then announced that we were leaving and gave us a choice of two different routes that both involved Central Park. I told him he should just go with the one with the least hills. So of course, some teacher’s pet group member said, “Hills will make us stronger.” Now pace leader looks at me and announces that because of my statement we will go the hilliest route. Insert big eye roll. So off we go to the roller coaster they call Central Park. And yes it was crazy hilly in the pouring rain. After exiting the park we soon arrived at JackRabbit Upper East Side. Now this is when I realize that we were going to have to run 9 straight miles through Manhattan into Brooklyn for our third stop. And this is where things start to get dodgy. 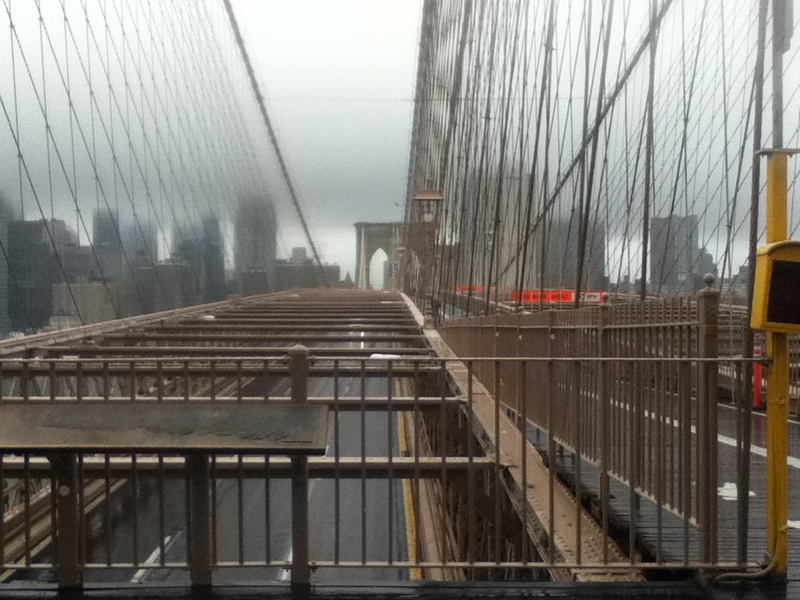 Now we are running down Lexington Avenue from 85th Street all the way downtown … and again I say, in the pouring rain. Picture this. The sidewalks are narrow and packed with people and wait for it … it is pouring rain. So now we are trying to get by pedestrians and we are puddle jumping off and onto the curb at every intersection … and not clearing all of those puddles I might add. By the time we got to the Manhattan Bridge we had lost four members of our pace group for various reasons. Running across the Manhattan Bridge was no joke and the loud and boisterous train that crosses it didn’t make it any more pleasant. Anyway, kudos to Pace Leader, because he was upbeat the entire time and made sure no one got left behind. 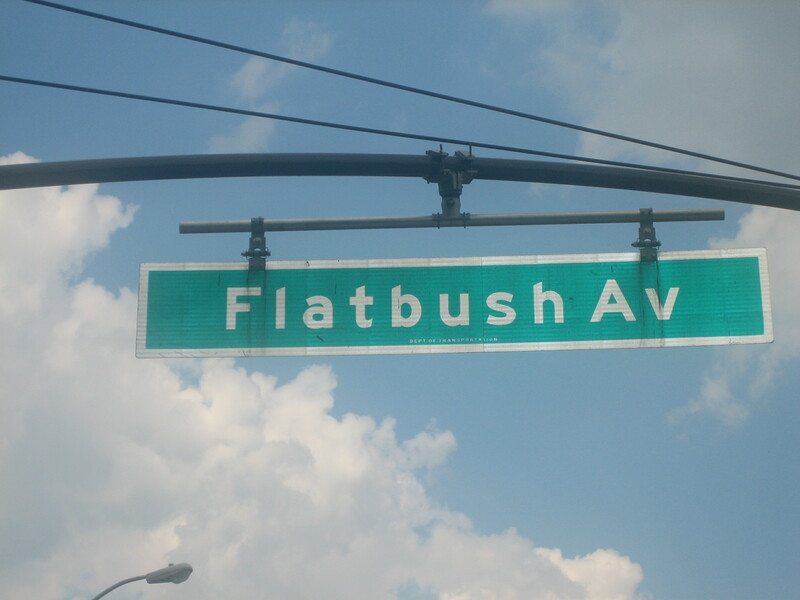 Finally we were in Brooklyn and we were on a mission to get to the Brooklyn store. 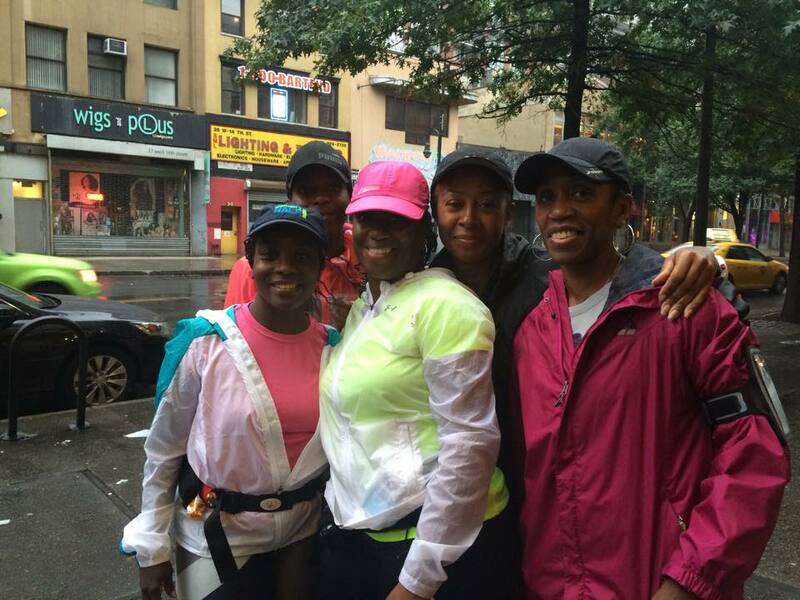 We ran down Flatbush Avenue and saw members of a faster pace group. 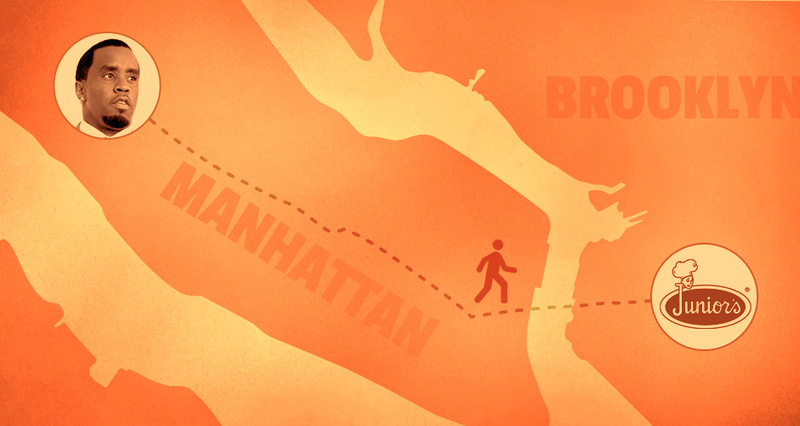 They were on their way back to Manhattan. They cheered us on and were high fiving us. This was good and bad. Good because they looked excited and fresh so the store had to be close. It was bad because I wished that I too was on my way back to Manhattan. But even though we had to be close to the store it just wouldn’t show itself. We were supposed to get there at mile 15 but that marker came and went. By the time we finally got there my watch was reading 15.4 miles. Now I’ll be honest. I was feeling pretty wrecked by the time we got to the store. But we had come this far. We lost four more at the store. When we went back out to hit the streets, Jazz gave us a good pep talk and another group member suggested that we slow it down and run the last five miles together. So we left seven strong. As we passed Juniors restaurant, I recalled the season of Making the Band when P. Diddy made the band walk to Juniors from Manhattan to fetch him cheesecake. I felt bad for them at the time. Now I was thinking, puhlease, at least he didn’t make them run in a monsoon. My little escape from reality didn’t last very long because soon we were crossing the Brooklyn Bridge in all of its steep inclined glory. That climb was really tough. But we made it. At this point I had to dig deep to get to the end. But we had passed mile 17 and so I was waiting for the mile 17 to 20 magic to occur as promised by our cheerleader. Once we got into Chinatown, it was apparent to me that this run was going to be longer than 20 miles. Scroll back up to Arnold’s image. This couldn’t be possible because I didn’t think I could go one extra step but my watch was registering 19 miles and I knew we weren’t that close to the Union Square store. So now I was getting annoyed because I didn’t want to run any more and there was no magic. But we plugged along and when I turned onto 14th Street, magic occurred. I got energy out of nowhere and started moving because I knew the store was close. When I saw a familiar cafe, I yelled to Janet, “We’re almost there!” And before you know it we were. My watch had us at 20.85 miles. The people in the store cheered us in. We did it!!! We changed our clothes. I am so glad that I thought to bring a change of clothing but realized that I should have brought a change of shoes and socks too. I purchased a pair of socks from the store and they were thick enough to assist a little with my soaking wet running shoes. JackRabbit provided a nice bagel and coffee spread. I was starving and scarfed down my bagel and then we hopped on the subway. And of course as we exited the subway car at Penn Station another mentally unstable person approached Janet and gave her an earful. But we let her continue to hang with us anyway. 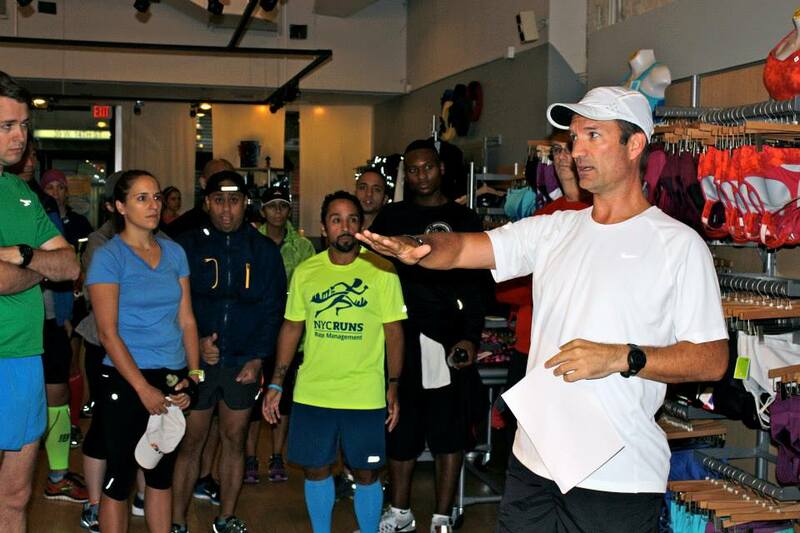 I have to say thank you and kudos to JackRabbit for providing this complimentary training run. And a special shout out goes to Chris, our pace leader. He did a great job.